London Theatre Direct offers a number of solutions to add a lucrative revenue stream to your website or app. Get in touch to find out which of our versatile partner solutions would best benefit you and take the hassle out of ticketing. Our world class API solution puts the power in your hands. Direct access to over 6 million tickets, live connections to over 150 theatre venues, and generous commission structures put the London Theatre Direct API head and shoulders above our competitors. Our purpose-built Travel Trade and Concierge solution is optimised for face-to-face sales. In a few clicks you can provide your customers with a first class London Theatre experience. Our realtime booking system even allows you to sell last minute tickets - right up until show time! As well as a range of end-to-end ticketing solutions tailored to suit any business, London Theatre Direct also offers a showstopping suite of free services for all our partners. With London Theatre Direct powering your company behind the scenes, you're sure to steal the show! 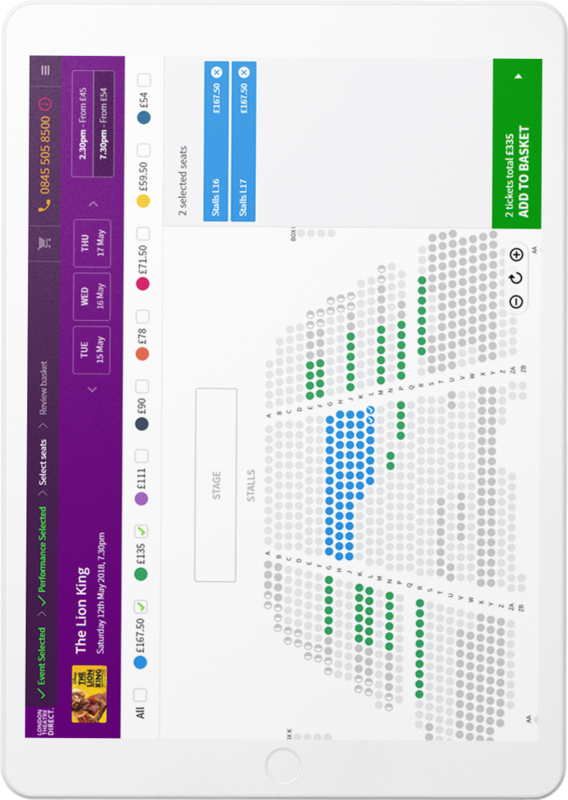 Give your customers the the freedom to to choose seats directly from our mobile friendly seating plans - now available for API users too!